Why study coral reef ecosystems? Having survived millions of years, coral reefs are among the oldest and most diverse ecosystems on earth. Learning about coral ecosystems encompasses many of the 9-12 grade science curriculum standards. Life cycles of organisms, biological structure and function of organisms, and the behaviors and adaptations of organisms to their environment are all topics easily studied through a focus on coral reefs. All populations in this ecosystem are interdependent and part of a global food web. Healthy coral reef ecosystems are important to the humans, plants, fish, and other organisms that depend on them. However, the increasing impact of climate changes and human activities is endangering the very survival of these ecosystems. Pollution, habitat loss, invasive species, and diseases are all threats to the survival of coral ecosystems around the globe. Learning about them- “their fragility and value”- will help students understand what is needed to protect them. This SciGuide highlights outstanding NOAA resources, such as online tutorials and complete, hands-on, inquiry based lesson plans from the National Ocean Services. These resources address three areas. First, students can study the biology of the coral organism, learning about types of coral and where they are found. 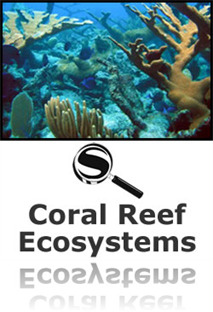 Next, resources focus on the populations, habitat, and dynamics of coral ecosystems. Finally, teachers and students, through online data sources and activities, learn about conservation of our coral ecosystems. Natural threats, human disturbances, and the benefits of coral protection focus students on the real world importance of science learning. SciGuides are really fantastic.When it's time to teach about ecosystems, I can be confident knowing I'll have the Coral Reef Ecosystems SciGuide to go to for lesson plans, simulations, and web-based resources. I'll be able to create outstanding lessons in a shorter amount of time since many resources are easily accessible in this SciGuide. This sciguide was a really great resource for my 8th grade science class while we were covering our oceans unit. Being from Hawaii, many of my students have experienced the ocean and the ecosystems that encompass it. However, they only see it as an area for them to hang out or catch fish from, without understanding the system and how it works, along with how delicate it is. My students also really grasped the concept of interdependence and how the removal or addition of a certain type of marine animal can result in the increase or decrease of others. I really love teaching this topic because I am an avid fisherman and in order for conservation to occur, we need to teach this generation and the next about how human impact can affect ocean habitats and the sustainability of life both in the ocean and on land. I looked through the Coral Ecosystems and stumbled upon a some great resources and lesson plans that deal with coral ecosystems. I really liked the "Coral Reefs and Their Place in Interdependent Ecosystems" link. In the link there was a neat scavenger hunt handout that goes with the computer simulation. The great thing is, I could probably modify the handout and take the students on a field trip to visit a local coral reef after going through the simulation and they can make comparisons. The Ocean Quest link will also be helpful for the students on the field trip. The could look at some of the pictures and see if they can identify them while at the coral reef. All in all, this is a great place filled with many helpful resources. I found this SciGuide to be quite spectacular as it was very captivating to learn about ecosystems and its diversity. I think that it is crucial for teachers, especially those who live and teach in Hawaii to understand how fragile our coral reef "systems" are to the world. In Hawaii, the beaches and reef are our student's backyard, and they need to learn ways to take care of their home environment. As a Kindergarten teacher, I notice that many of the students have the misconception that "coral" are "just rocks" making coral a "non-living" thing. It is our responsibility to educate ourselves as well as teach our students what coral reefs really are and how important they are to our Earth's system. This SciGuide gave me a lot of background knowledge which helped me as I read other SciGuides and SciPacks. This SciGuide is very comprehensive and follows a logical and natural succession of topics. It is separated into three themes: Coral Reef Biology, Coral Reef Ecosystem, and Coral Reef Conservation. I say that this SciGuide follows logical topics because students it makes sense for students to learn about what coral reefs are actually made of and then learn about the various animals that call the coral reef their home. After learning about these two topics, students should learn about how they can help protect and preserve the coral reef. Each theme had many links that students and teachers can explore. Many activities had pre-made worksheets that students can work on when exploring the web sites. I think this SciGuide is a great place to start if a teacher is planning a unit on the coral reef. This sci-guide has provided me with a year-long network of lessons just on the topic of coral ecosystem. It extended my already profound idea of the topic into all other fields such as environmental science, anatomy, physiology, biochemistry, and a lot more. There is enough topics to cover both content ant pedagogy for the classroom. The internet resources are so inexhaustible, one link leads to another. I have enjoyed using this SciGuide because it has actually provided me useful and relevant information that I could immediately use in my classroom without having to “reinvent the wheel”. It provides a general overview of Coral Ecosystems and then goes into greater depth under three different themes: 1) Coral Reef Biology, 2) Coral Reef Ecosystem, and 3) Coral Reef Conservation. Within each thematic unit, it provides another more specific general overview along with breakdowns between grade levels, lesson plan resources, and additional resources. Most of the informed sources and information available is rated for grades 9-12. However, with minimal “customization”, I was able to bring much of this information into the classroom. Admittedly, it does help I live in Hawaii and it is a topic already near and dear to the hearts of my students. The simulations are short and to the point – enough to explain a concept that engages our mostly media savvy students. One of the most useful portions are the vetted links they have. NSTA has obviously worked closely with scientists and government agencies, such as NOAA, to develop and disseminate good information that as a teacher, I can feel comfortable using. Really neat media events that are easily used to guide instruction are linked within a box and is fast to access. For example, I really enjoyed seeing the coral spawning – a rarely seen reproductive event. This SciGuide highlights NOAA and NOS resources with tutorials and hands on lesson plans. It is organized into three sections. The first section is the biology of the coral organism, the polyp and its symbiotic relationship with zooxanthellae. There are links to the different types of coral and where they can be found. The second section focuses on the population, habitat and interdependence of coral ecosystems. The third section discusses the threats to our coral reefs and what we can do to protect them through monitoring and conservation efforts. I find the overall design of this guide well done and easy to follow. Information is up to date, reliable, contains diagrams, simulations and graphics and focuses on the real world importance of science learning. It also includes a roadmap which complements the tutorials and links you to specific online coral data and information from NOAA and the National Ocean Service. This SciGuide was very useful in teaching about ecosystems with a clear focus. Instead of learning in general about populations and dynamics, a specific aquatic ecosystem is used as an example. This is very relevant to any student in Hawaii because of the abundance of coastline and coral reefs. The extension of coral reef conservation is a hot topic due to many of the tourists who visit Hawaii being uninformed about coral reef damage. I could incorporate these concepts to the relevance of my local students’ lifestyles. I would build upon their prior knowledge, based on their daily lives, and hope to add to their education about the shoreline. I believe it will definitely pique their interest by incorporating environments and organisms that dwell in familiar places. A sense of relevance is experienced by conducting hands-on labs with samples of actual material and data, along with mini field trips around campus and the community. I do not have many suggestions in order to improve the SciGuide. I believe the vital concepts were covered with a great deal of supporting evidence and exercises. I enjoyed previewing these SciGuides and gained many ideas that will help me and my students in the future. The Coral Ecosystems (9-12) SciGuide is an excellent resource to help you integrate the study of current coral reef biology and environmental issues into your science curriculum. This SciGuide provides a wealth of teaching resources organized by three themes: 1) Coral Reef Biology, 2) Coral Reef Ecosystem, and 3) Coral Reef Conservation. There is an emphasis on coral species, coral ecosystem dynamics, benefits of corals, natural and human threats to corals and coral reef conservation. Teaching resources include web-based resources, lesson plans, current data, vignettes (case studies), simulations and video clips. Lesson plans are provided with teacher descriptions of implementation and sample student work. Website links are helpfully organized by two categories: teacher sites and student sites and are also searchable by a filter. It was very informative. It helps with sllowing students to improve on their understanding of the concept. The Coral Ecosystems SciGuide is a very useful resource to get ideas on lessons & activities you can implement in your classroom. It provides a wealth of great websites filled with information & pictures for educators, as well as interactive activities for students. I especially like how it’s broken down into three themes: Coral reef biology, coral reef ecosystem, & coral reef conservation for easy reference when covering a specific topic. This is a great collection of resources for the study of coral reef ecosystems, covering coral reef biology, ecosystem and conservation. There are many educational yet fun interactives such as the “Make a Reef”, “Populate a Coral Reef”, and “Life in the Balance” simulations where students design a functioning ecosystem. A detailed “Reef of One’s own” lesson plan is included where teachers provide resources for students to complete a written report on the coral reef ecosystem. I could use the many coral reef simulations for students to apply concepts taught in class. They can try out different ways to create and ecosystem through trial and error to see what works. I could also used the detailed lesson plan on “A Reef of One’s own” to allow students to synthesize what they’ve learned in the unit. Overall, it’s an excellent SciGuide for all levels k-12. Coral Reef Ecosystem SciGuide Review The SciGuide on Coral Reefs is a good resource for my upcoming unit on ecosystems. What I find helpful is how they took the time to break down the unit to make it simpler for someone like me to choose specific lessons that hits my benchmark. For this unit, the SciGuide started off with Coral Reef Biology with subtopics explaining what a coral reef is and how it is formed. I really like how they provide various learning activities such as videos on how coral blooms forms, providing various websites with lots of visuals on coral, and solid core information on corals. Once gaining a basic understanding of coral, they go into the various types of coral and where they are found in the world. Having sites for teachers is an effective way for me to brush up on my knowledge of the types of coral and the sites for students is just as effective as well. Students are able to take quizzes on coral and even have websites that provide them with more in depth knowledge if they have a research paper to be completed. Overall, I am impressed on how well of a job that they did on breaking down this unit to make it easy for someone like me to understand. I would utilize this SciGuide into my teaching by going back to my own curriculum map and figuring out how many weeks I have. Next, I would look at my specific benchmarks and use the SciGuide as a guide to my instructions and create a mini-unit. I would have my students do a authentic learning project as their summative. Each student will be creating a biome shoebox with each part of the shoebox hitting a specific benchmark. To build the students up to that point, I would build background knowledge of coral reefs and provide them with an activity (reading, video, quiz) from the SciGuide on coral reefs. Once they show understanding, I would use the next subtopic on the various types of corals that exist and explain where they are found in the world. I would incorporate the food chains for coral reefs and how the provide an ecosystem for other life. Once they gain the understand, I would use the coral reef webquest to help get the students an appreciation for coral and how they can be part of the solution instead of the problem. One suggestion that I do have in the SciGuide is to provide educators with a curriculum map of how they would incorporate it into the classroom. I believe that by incorporating a curriculum map, educators like me could adapt the lesson to fit into our own curriculum maps. We could pick and choose what we like and don’t like but it would provide educators with a starting point on where to begin. Another suggestion that I do have is providing a summative assessment for educators to use as a way to guide their own instructions. I believe this would help a lot and would keep educators focused on what they are teaching. I just finished working my way through this resource and think it would be great to use in a classroom. It is neatly divided into several sections so you could use small chunks of it with the students rather than having them work through the entire lesson. I like the questions at each section and then the over-all summary quiz at the end. I might use it with the class as a whole and have them keep track of their answers to the quiz questions as we went or even make up their own questions. I might have them each download if I had access to a class set of computers so they could do this as individuals. I would want the students to analyze each of the problems posed in the lesson and then propose solutions. For example, how can we reduce or eliminate run-off? What can be done about ocean acidification? I would like the students to be able to ascertain natural causes from those introduced by humans. We have no control over hurricanes but we can control trash. I would like the students to use this lesson to analyze issues and actions. I enjoyed completing the SciPack Coral Reef Ecosystems, and was excited to check out the corresponding SciGuide. Unfortunately the SciGuide targets high school, but I decided to check it out hoping to find something I can use in my fourth and sixth grade science classes. The three themes covered in this SciGuide include: coral reef biology, ecosystem, and conservation. I really like the different links including NOAA's National Ocean Service: Corals. Be sure to check out The Coral Kingdom where you can find pictures of coral reefs around the world including Florida, the Pacific ocean, the Red Sea, and Caribbean reef. Some of the albums featured include vertebrates, invertebrates, artificial reefs, and diving biologist. My students and I enjoyed viewing these vibrate photographs. I hope NSTA will consider making a coral reef SciGuide for elementary teachers. The Coral Ecosystems SciGuide provides an overview of potential resources that would be appropriate to teaching about coral organisms, its symbiotic relationships with zooxanthellae, habitats of coral reef creatures/relationships between the coral reef organisms, or how to address the human impacts relating to the coral reef environment. This SciGuide focuses on three themes: 1) Coral Reef Biology, 2) Coral Reef Ecosystem, and 3) Coral Reef Conservation. I found the biology section very helpful in understanding how I could present information about the structure and function of the coral as a living organism. The lesson plans target directed/group-based instruction primarily for high school students (9-12) and need to be heavily adapted down for middle school (6-8) and elementary school teachers (k-5). My fellow elementary educators really need to sift through the lesson plans to see what might work for them, if technology is not easily accessible. Tutorials for my entire class are not a viable option. I did appreciate the wealth of Web-based resources like the photo galleries of coral reef organisms, movies, and simulations (for my betterment as an educator). I especially liked the student-friendly Fisheye View cams (a provided link), that allow students to see time-lapse coral spawning. I showed my students the multitude of galleries through classroom projection, and they were impressed! I would like to see more opportunities for other NSTA teachers (or forum members) have the opportunity to directly use their input to adapt elementary-based lessons. The SciGuide is a starting point, but I need to be more creative and find hands-on materials appropriate for eight-year-olds. 1. What are some key points from the SciGuide that made an impression upon you? The Coral Reef Biology SciGuide is a great resource for teachers who want their students to learn more about the coral reef ecosystem. It provided links for leaning about the life cycle of corals, for different types of corals, for the distribution of corals. Included in the SciGuide are lesson resources called A Reef Of One's Own, in which there is a lesson plan, vignette, audio clip, a sample student work. I especially like the sample work because it shows what we should expect our students to produce. The additional media resources are great to show students movies or have them go through simulations where they use their what they learned to complete the tasks. 2. How could you utilize this SciGuide in your teaching? I could use the SciGuide in my teaching because I am focusing on abiotic factors in ecosystems and I am about to do a watershed project in which we are testing the water for various factors, such as pH and turbidity. I would like to show my students why we are testing for these factors and how they affect living things. Showing the simulations can help with this. 3. What are some suggestions for improvement in the SciGuide? What I would like to see in this SciGuide is section on links to the abiotic factors that affect coral reefs. This guide contains a list of pertinent URLs as well as some nice lessons plans on reefs. What I think teachers will find cool is they can access simulations to use in their classroom that can be used full screen. The Create a Reef is one of my favorites!